Choosing the correct artificial lawn will be one of the best purchases you will ever make! As one of Europe’s leading artificial grass providers, we believe in offering high quality and completely safe artificial grass for our customers. 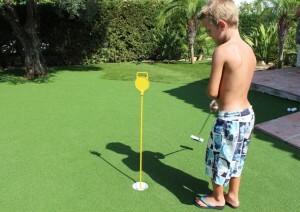 We also understand the importance of supplying the best artificial grass that families can rely on. For this reason, we manufacture our grass with your family’s concerns and comforts in mind. If you are in need of grass for your children’s play area or for your garden, you are in the right place to get the best from our comprehensive EliGrass lawns available. Our lawns can be used throughout the year—our artificial grass is ideally suited for year round use, all while providing your outdoor space with comfort and beauty all rolled into one product. You never have to worry about surprise toxic chemicals or harmful byproducts when you choose EliGrass. 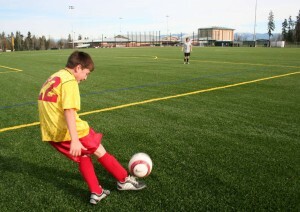 Additionally, our turf is soft enough to cushion your child’s fall making it perfect for households with young children. Your number one concern is your children’s safety, and by choosing artificial grass you can guarantee your children never experience grass burns in your garden again. Most of our range is soft like real grass and cushions like carpet, looks like grass, just without the hassle of real grass. Your children’s play area might be full of mud and dirt that would typically end up indoors, leaving you with one more mess to clean up. With our safe artificial grass, you will have no mess from muddy footprints thanks to hard waring durable green lush lawns. Whether your children love football or simply love being outside, we offer the best artificial grass for playing and enjoying the outside world. All of our products are designed and tested to support your family’s needs, whether you’re looking for an attractive lawn or require a product that puts safety first, you’re in the right place. 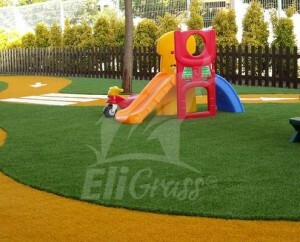 For the best artificial grass for your children’s play area garden, you can rely on EliGrass.